It was been a record breaking start for ParalympicsGB in Rio. 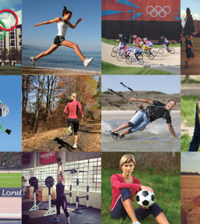 On Sunday, ParalympicsGB enjoyed their most successful day at Rio 2016 so far with 21 medals won across five different sports – more than the best single day at London 2012 (18) and Beijing 2008 (19). Stand out performances came from Dame Sarah Storey as she became Britain’s most successful female Paralympian by claiming her 12th gold medal on the opening day of the Rio 2016 Paralympic Games. 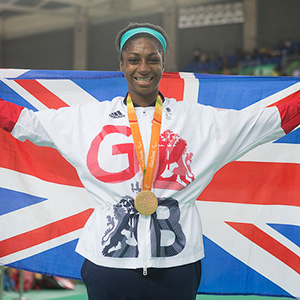 Kadeena Cox (above) became the first women since 1988 to win medals in two different sports. Hannah Cockroft successfully defended her athletics 100m T34 title and Bethany Firth won double gold in the pool. Cycling: Dame Sarah Storey wins C5 individual pursuit to claim record 12th Paralympic gold medal. Dame Sarah Storey is Britain’s most successful British female Paralympian of all time after victory in the C5 3000m individual pursuit. Dame Storey, competing in her seventh Paralympic Games, caught teammate Crystal Lane after 1,375m to earn ParalympicsGB’s second gold of Rio 2016 and move clear of Baroness Tanni-Grey Thompson on 12 gold medals. The 38-year-old now has 12 golds, eight silvers and three bronze Paralympic medals across swimming and para-cycling events. Megan Giglia won ParalympicsGB’s first medal of the 2016 Paralympic Games with victory in the C1-3 Individual Pursuit on Thursday evening. The Stratford-upon-Avon para-cyclist caught opponent American Jamie Whitmore in the gold-medal ride to take the title on her Paralympic Games debut. The 31-year-old had earlier broke her own world record in the heats when she recorded a time of 4:03.544. 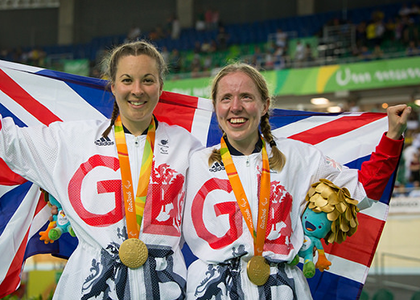 Sophie Thornhill and pilot Helen Scott set a new Paralympic record in the women’s B 1,000m time trial as they secured ParalympicsGB’s first medal of day two at Rio 2016. Thornhill and Scott posted a new Paralympic best of 1:06.28 in the penultimate ride and when the Dutch pairing of Larissa Klaassen and Haleigh Dolman failed to surpass the Brits’ time, gold was confirmed. 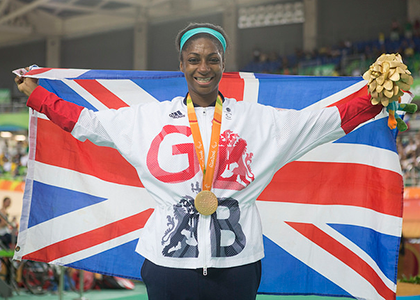 Kadeena Cox kept up ParalympicsGB’s golden track cycling run at Rio 2016 with victory in the women’s C4-5 500m time trial. It was all the more impressive considering just 24 hours earlier Cox had secured 100m T38 bronze on the athletics track. 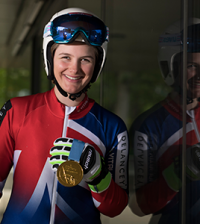 She becomes the first British Paralympian to win medals in two different sports at the Games since Isabel Newstead, who won shooting bronze and athletics silver and bronze at the 1988 Games in Seoul. Lora Turnham and pilot Corrine Hall (below) kept the gold rush ticking over in the Olympic velodrome as they took victory in the women’s B 3000m individual pursuit final with Sophie Thornhill and Helen Scott taking bronze. Turnham and Hall – who set a new Paralympic record of 3:27.460 in their heat – won an emphatic gold medal ride by nearly three seconds from silver medalists New Zealand in 3:28.050. Hannah Cockcroft won her third Paralympic gold medal and retained her 100m T34 title on Sunday evening in a Paralympic record time of 17.42 seconds. Cockroft finished in style with a clear margin between her and the rest of the field and said she can now relax and enjoy her next two events of the games. Double world champion Hermitage powered across the finish line in a world record time of 13.13 seconds to mark her Paralympic Games debut in style. Libby Clegg swept aside the drama of earlier in the day to take gold in the 100m T11 alongside guide Chris Clarke. Bollington’s Clegg set a new world record of 11.91 in the semi-finals earlier in the day at Rio’s Olympic Stadium before being disqualified on the basis she had been illegally pulled by her guide. But an appeal was successful and the reinstated Clegg and Clarke were back on form in the final, clocking 11.96 to take the gold medal ahead of China’s Zhou Guohua by two hundredths of a second.It is a third Paralympic medal for Clegg after consecutive silvers at Beijing and London in the T12 category. Nottingham’s Sophie Hahn completed the full set of major international titles at the age of just 19 with a Paralympic record-equalling run of 12.62 in the 100m T38. 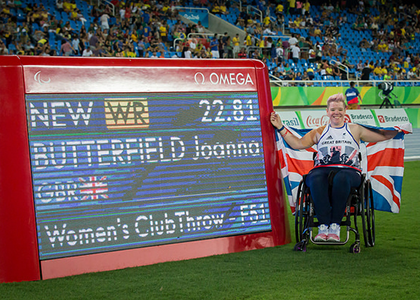 Joanna Butterfield won gold and set a new Paralympc record in the F51 Club throw Late on Sunday – more details to follow. It was double success for ParalympicsGB in the women’s 100m backstroke S14 as Bethany Firth defended her Paralympic title ahead of teammate Jessica-Jane Applegate in third. County Down’s Firth lowered the world record she had set in the day’s earlier heats to touch the wall first in 1:04.05. Bethany Firth claimed her second Paralympic gold in Rio as she led home a ParalympicsGB one-two in the women’s 200m freestyle S14 final. Firth finished well ahead of team-mate and defending champion Jessica-Jane Applegate, clocking a Paralympic record 2:03.30. Fifteen-year-old Ellie Robinson broke the Paralympic record on her way to claiming the S6 50m butterfly title. The Northampton para-swimmer is competing in her first Paralympic Games but she posted a time of 35.58 to claim gold. Eight years after she topped the Paralympic Games podium as a handcyclist in Beijing, 37-year old Rachel Morris took gold in Rowing. 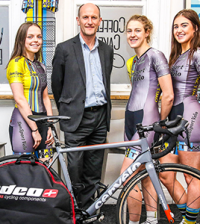 Morris only took up rowing in 2013 when looking for a new sporting challenge, after winning the cycling road race bronze at London 2012. Lauren Rowles and Laurence Whiteley led from start to finish to win mixed double sculls rowing gold at the Paralympic Games in Rio. Rowles, just 18, only took up the sport last year to the delight of 25-year old Whiteley, who had been searching for a suitable partner for two years. 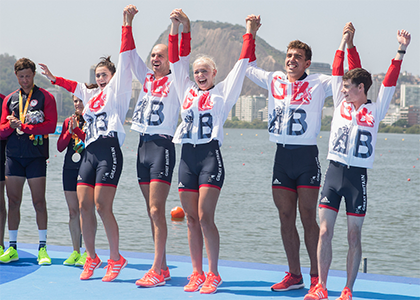 ParalympicsGB’s mixed coxed four crew made it three rowing golds from four events as they defended their title from London 2012. Cox James Oliver called the tactics while Grace Clough, Daniel Brown, Pamela Relph and James Fox provided the power. Relph – the only surviving member from the winning four in London – said this crew was ‘stronger, fitter and faster’ and she proved good to her word, with the United States and Canada completing the podium. Harriet Lee won ParalympicsGB’s third swimming medal of Rio 2016 as she finished second in the 100m breaststroke SB9 final, one place better than the bronze she won at London 2012. Rebecca Redfern smashed her own 100m breaststroke SB13 world record but still didn’t win gold as Uzbekistan’s Fotimakhon Amilova went even faster. Redfern, 16, touched in 1:13.81, impressive considering her previous best was 1:15.96. 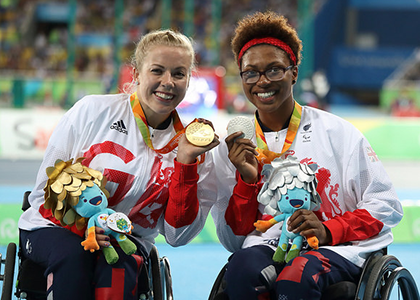 Stef Reid secured ParalympicGB’s first athletics medal in Rio with a silver in the women’s T44 long jump. European champion Reid, 31, who was a silver medallist in London four years ago and a bronze medallist in the T44 200m at Beijing 2008, recorded a best effort of 5.64m. France’s Marie-Amelie Le Fur took gold with a world record leap of 5.83m. Coventry’s 15-year-old Kare Adenegan (Below right with Hannah Cockroft left) won silver in the 100m T34 in a personal best time of 18.29. She finished second to 24-year-old wheelchair athlete Cockcroft from Halifax who got out quickly and stormed away from the field to claim gold. Lauren Steadman marked her third Paralympic Games appearance with silver in the women’s triathlon PT4 event. Steadman, who previously competed at Beijing 2008 and London 2012 as a swimmer, was leading before being caught by American Grace Norman in the final stages at Fort Copacabana. Alison Patrick took the women’s PT5 triathlon at the first edition of the sport in the Paralympics. Stephanie Millward swam her way to a bronze medal in the 400m freestyle S8 on day one of the Rio 2016 Paralympic Games. Millward, who trains in Manchester, touched the wall third in 4:49.49 behind Australia’s Lakeisha Patterson who won in a world record time of 4:40.33. The bronze represents Millward’s sixth Paralympic medal after four silvers and a bronze at London 2012. Greenwich’s Susie Rodgers won ParalympicsGB’s first swimming medal of day two by claiming bronze in the S7 50m freestyle. The 33-year-old posted a personal best of 33.26 to secure her fourth Paralympic bronze medal after three at London 2012. Great Yarmouth’s Applegate was third in the women’s 100m backstroke S14 in a time of 1:08.67 with Dutch swimmer Marlou van der Kulk in silver and Bethany Firth gold. Alice Tai didn’t even expect to make the ParalympicsGB team – but she’s leaving Rio with a bronze medal after a storming swim in the 100m backstroke S10 final. Four years ago Tai, just 17, carried the Olympic torch before London 2012 and watched every session of Paralympics swimming. Amy Marren, who turned 18 last month, turned for the concluding freestyle leg in front but Ping of China came through to win while Spain’s Sarai Gascón claimed silver. Marren was a four-time world champion three years ago but little has gone right since, as her form evaporated and she only just made the qualifying time in the trials. Swimming: Bronze for Stephanie Millward in the women’s 100m freestyle S8 final. Millward clocked 1:05.16 while Australia’s Maddison Elliott took gold ahead of her team-mate Lakeisha Patterson. Millward, who won bronze in the 400m freestyle, will now go in the 100m backstroke S8 in which she is the reigning world record holder. Powerlifter Zoe Newson matched her achievement of London 2012 as she claimed bronze in the -45kg category. Colchester’s Newson successfully lifted 102kg to place third behind Nigeria’s silver medalist Latifat Tijani while China’s Paralympic champion Dandan Hu won with a lift of 107kg, later setting a new world record of 108kg in the bonus round. Gemma Prescott claimed ParalympicsGB’s second track and field medal of day two with bronze in the women’s F32 club throw. Truro’s Prescott finished with a best effort of 19.77m to finish third, just ahead of teammate Abbie Hunnisett in fourth with 19m. Prescott’s bronze adds to the bronze the 32-year-old won four years ago in London. Sabina Fortune secured ParalympicsGB’s first track and field medal of day three in Rio with bronze in the F20 shot put. The 19-year-old Chester athlete was in the third place after her first attempt of 12.33m but saved her best until last with a personal best distance of 12.94 on her sixth attempt. Melissa Reid won bronze in the women’s PT5 triathlon at the triathlon event in Copacobana, Rio.